Ever have days where you feel like your hair is just an oily mess? For most people, this probably occurs on 2nd or 3rd day hair. Some of you may be used to washing your hair everyday, but doing so can strip away the natural oils which can leave your hair dry, flat and weak. I heard about dry shampoo a few years ago. It’s used as a quick fix for greasy/oily roots and days where you just don’t have time to wash your hair. I have previously tried the Tresemme brand and the Principessa Beauty dry shampoo. They were decent, but I was looking for something a little better at controlling oil. I like that the Tresemme one comes in an aerosol can, but the Principessa Beauty one comes in a tin and you have to use your hands or a brush to transfer the product on to your hair (which could get messy!). 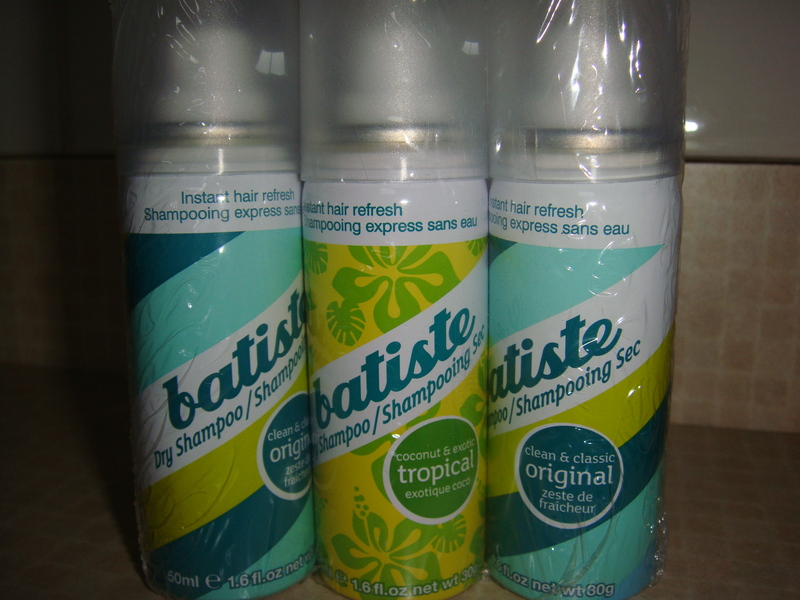 The Batiste dry shampoo is one that I have heard many great things about. I like that it is in an aerosol can so you do not have to use your hands and that way it’s less messy. I found these mini versions of the brand to try out first before I purchase a full size. These are also convenient for travelling! I purchased these at Marshall’s for around $10 (3 x 50ml). Verdict? I like it! To use it, you just section your hair, hold the can about 30 cm away and spray your roots. Then you can use your hands or a comb/paddle brush (preferred) to evenly distribute the product. The product comes out white and definitely shows up as I have dark coloured hair, but the white goes away once you thoroughly brush it through. This dry shampoo also gives your hair some volume! Once you fluff your hair up using a brush, it makes your hair look fuller and more alive. I found that this kept the oils at bay for the most part from the beginning to the end of the day which is exactly what it is supposed to do. FYI: The original has no scent to it and the tropical one has a coconut/pina colada scent which I love. These also come in other scents and colours (ie. for dark brown hair, light & blonde tones). What is your experience(s) with dry shampoo? Are there other brands/methods that you suggest to try out? Let me know!